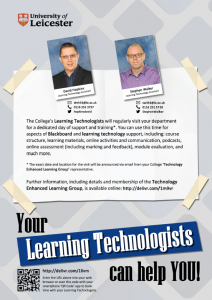 Since November 2012 both Stephen and myself have been available for technical and pedagogical support of Blackboard through our ‘hot desk’ sessions. These were devised and intended as a trial mechanism with which we can gauge the needs and requirements within each department for support, training, and workshops to support an individual, a team, or a whole department. For 2014 we propose to update the hot desk support model and introduce an updated and enhanced approach, whilst making sure we are able to still offer the same availability but with added features and times. A half-day hot desk in your department in the last week each month. Times will be 09:00 to 12:30 for a morning session and 13:00 to 16:30 for the afternoon. Weekly ‘Healthcheck’ offered for anyone wanting support or a quick chat about aspects of Blackboard, learning technology, etc. These will be advertised in advance and will take place in both Cafe North (North Campus) and the David Wilson Library (DWL / Main Campus). We will be available for the ‘healthcheck’ between 12:30 and 2:30 on Wednesday, January 22nd, and Wednesday, January 29th. If you want to book a dedicated time for out hot desk dates, with either Stephen or myself, please complete the booking form on the College website (login required).